… and surely among the very best in the entire state. Jane and I went back to Lambert’s last weekend with visiting sister and two of our dearest friends, who live just north of Taos and are Lambert’s regulars. Lambert’s is, In two words: fan tastic. Potato leek soup with crème fraiche and chives – served cold Excellent. 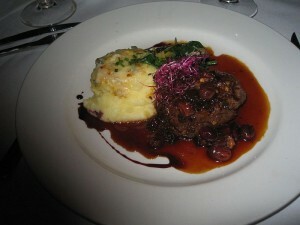 Buffalo Tenderloin with red wine demi-glace served with creamy mashed potatos and roasted fresh veggies. The tenderloin was grilled exactly to my specification – medium rare – and sliced in two to make two half-inch thick pieces served grill-marked side down and reddish side up. Now cooking buffalo can be treacherous – it’s little marbling can lead to dry tough meat. Not so here — it was fork-tender and succulent. 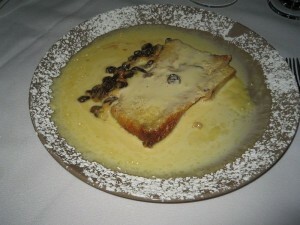 Desert was Bread Pudding with Rum Sauce. 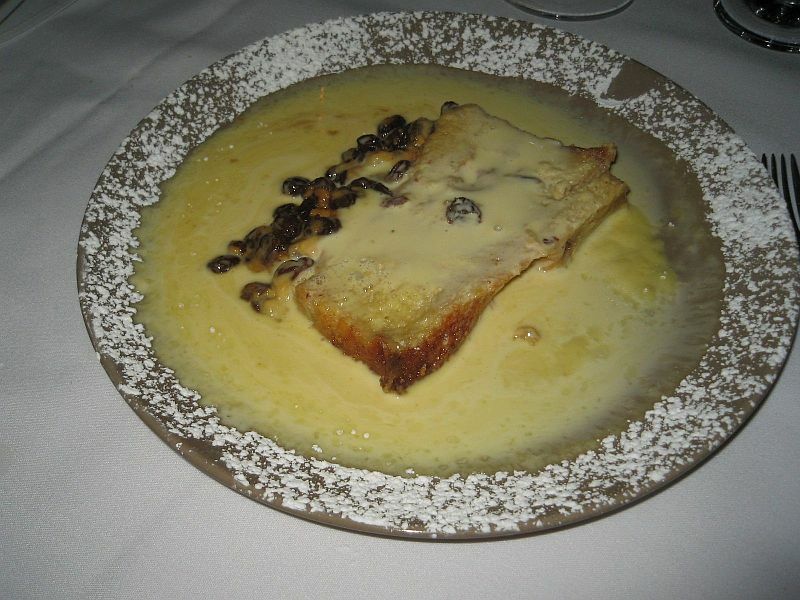 I search the globe for the best bread pudding. Lambert’s version wins in a romp. Visiting Sister had Vegetarian five nut pesto grilled radicchio Stuffed Portobello Mushroom Cap, warm lentil salad, grilled tomato, artichoke hearts, asparagus and feta cheese. Wonderful. Jane had a crusted halibut that melted in her mouth, and she awarded it her very-best-in-show ribbon. Andy had his usual Glazed Roasted Duck with an apricot chipotle sauce and pecan wild rice, but he substituted roasted potatos for the rice — a poor choice IMHO. 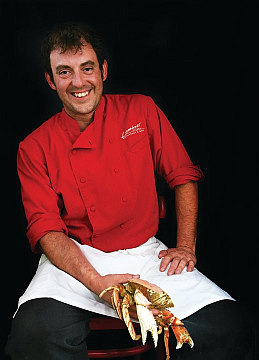 The duck was world-class. We chose Lambert’s fora very special Christmas Eve feast with Our dear friends and fellow gastronomes Andy and Sally Wasowski, their beautiful Daughter Sora Brody, and Sally’s charming brother Richard Hudson. We feasted at our usual corner table on the glass-enclosed summer porch. 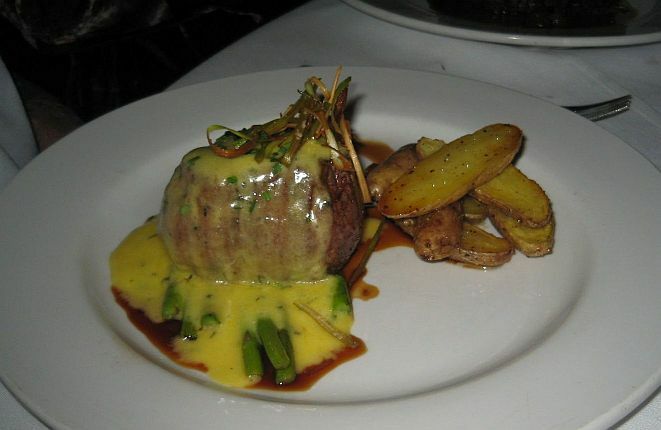 Richard had a fantastic beef tenderloin with a super-smooth Bearnaise. Accompanied by fingerling potatos and tender asparagus spears, this dish was a succulent masterpiece. Richard certainly agreed: he had had this dish before, and will probably have it again next year. Both Sora and Andy had a seafood appetizer that was as tasty as it was beautiful. Sautéed Lobster with Shallots. Yeah, real seafood right here in Northern New Mexico. Real lobster done right. 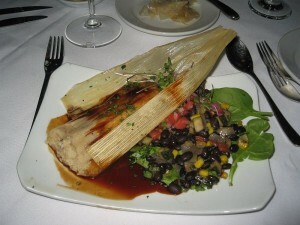 Sora and Jane had a Venison Tamale, as beautiful and tasty take on a Mexican standard as I have seen. Exquisitely prepared, it was accompanied by a black bean and corn salad. Just enough cilantro to make it mysteriously interesting. It doesn’t get much better than this. sweet potato fries and green bean salad. I have had this dish three times, and I guess that makes it my favorite. This is fabulous duck. Dark and cooked to perfection, it was almost butter-soft. “Our emphasis at Lambert’s has always been on quality and value. Our sauces are made from scratch. 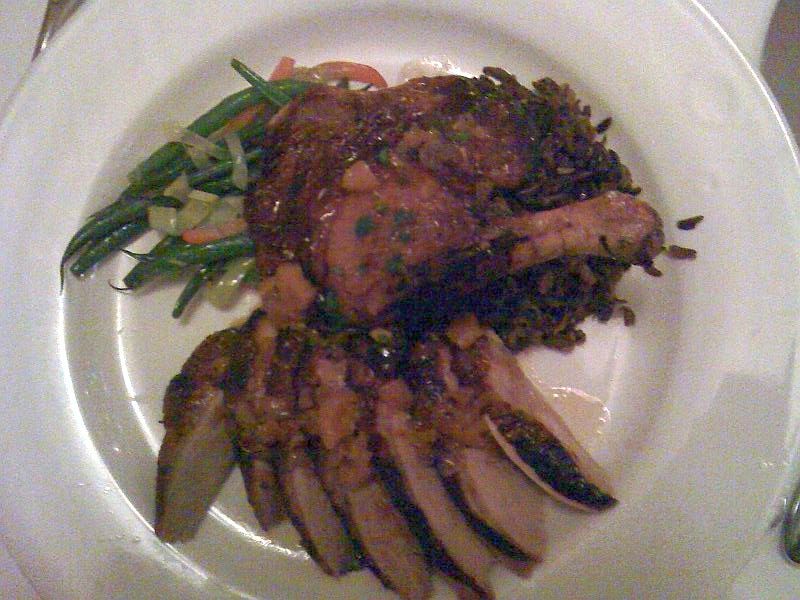 Some of them, such as the lamb demi—glace, take days to finish. The vegetables are fresh and local when available. 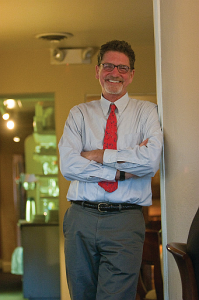 When asked to describe us, the word most often used by our loyal local clientele is ‘consistent’. We are also known for excellent service and distinctive and fresh cuisine offered in an elegant, warm and unpretentious atmosphere. 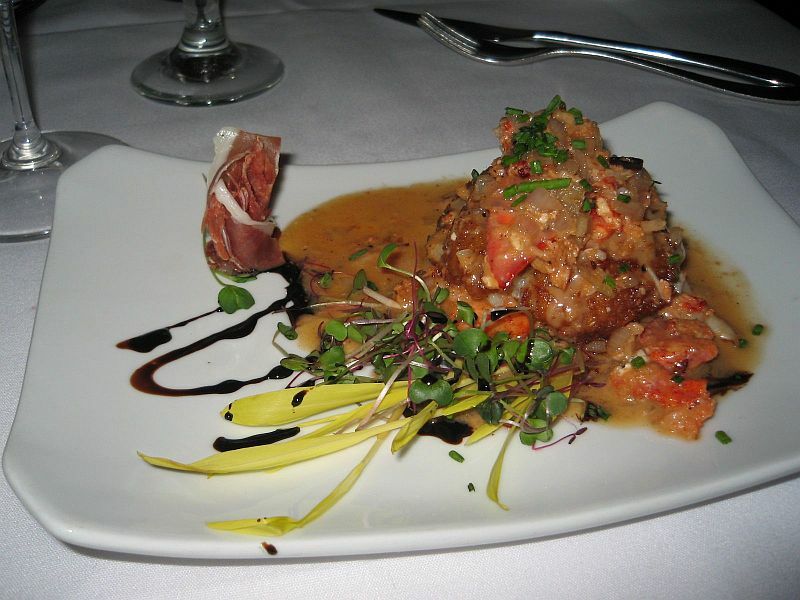 Our menu and wine list are created to complement each other. The extensive wine list is primarily Californian with some international favorites. We have high quality bottle selections in every price range, with reds, whites and a New Mexican sparkling by the glass. 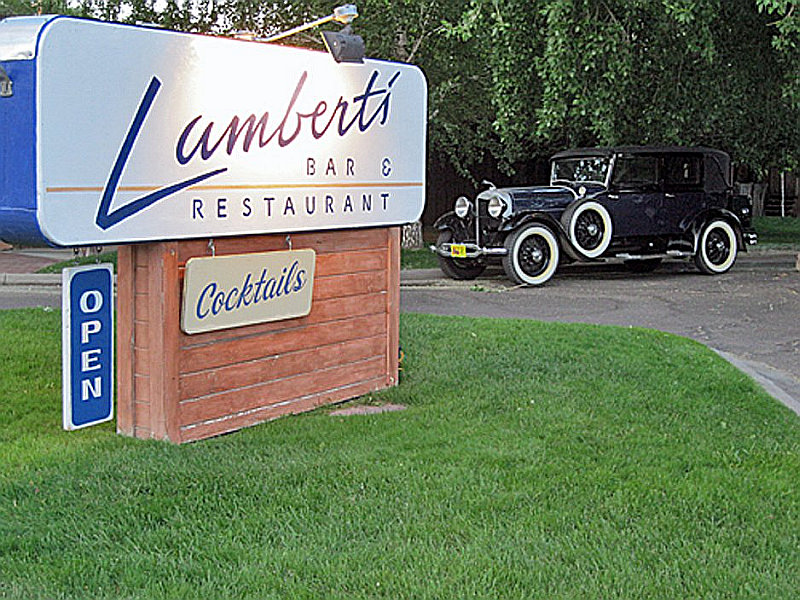 Lambert’s has a full bar with specialty cocktails such as Lemon Drop Martinis and Cowboy Buddha Margaritas, a range of single malt whiskies, brandies and exotic absinthe concoctions. With a special bistro style menu, the sleek, intimate bar and plushy lounge are the secret favorite rendezvous’ for an interesting variety of Taosenas and Taosenos. 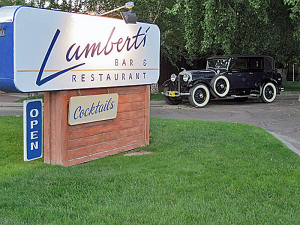 Lambert’s is as close to perfection as you are likely to get in these parts. All of my visits here have been memorable, and there surely will be many more. This entry was posted in Fine Dining, New Mexico Top Ten, Taos. Bookmark the permalink.